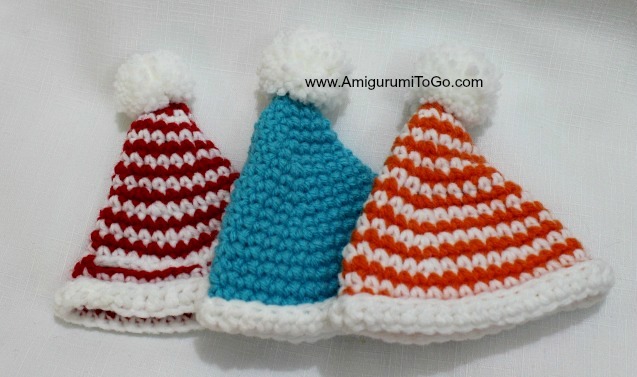 Okay friends, as promised here are the winter hats for the mice. And tonight I added another friend to the bunch so watch this blog for the next couple days for the Bunny pattern! If you want to get started on the bunny, the head and the body are the exact same as the mice, the eyes are wrapped around the same row. you will also find the option to leave a donation. Thank you so very much and enjoy! I did not measure out how much yarn I used. Please see question #3 here for the amount that's in the rolls of yarn I buy, for the mouse you need less than 1 package of Red Heart Super Saver. STRIPED HAT: If you want a hat with stripes. Using any color and white, start with the color first and switch to white on the last stitch of row 2. Then switch colors on the very last stitch of every row after that to row 18. Do not switch colors on row 19. You switch colors by starting a sc and finishing that sc by pulling the new color through the 2 loops on your hook. Keep the tension even while switching, making sure to hang on to the yarn tails until you get the next sc done. 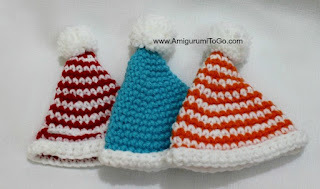 Do not break free from either strands of yarn from rows 2-18, instead just pull up the new color every time you need to switch, when you're all done you should not see any of the strands on the inside of the hat. sl st next st and f/o leaving a tail that can be weaved in. Fold the end of the hat up, it should fold easily where we worked in the FLO for row 20. If it doesn't want to stay folded up on its own just add a couple holding stitches around the rim. Don't pull the stitches tight or it will alter the clean look of the trim. Place the hat on the mouse or bunny with the ears through the slot as pictured. Adjust the hat so the ears are completely centered. You can use the yarn tail you f/o with or if your hat is solid color then use a length of yarn the same color as the hat, whip stitch the gap between the ears closed, making sure to not go through the head of the mouse. Start in one corner, going under the hat to star, come up and one stitch over then back under, weaving in and out through the white stitches as pictured. That way there are no stitches visible on top of the hat, they are all underneath. Make the stitches, no need to pull too tight, just snug enough to hold. Once you reach the other corner, take the hat off, knot the yarn tail off inside the hat and weave the yarn tail in. 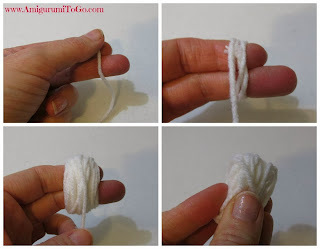 wrap yarn around 2 fingers as pictured. Wrap about 35 times. Pull off fingers. 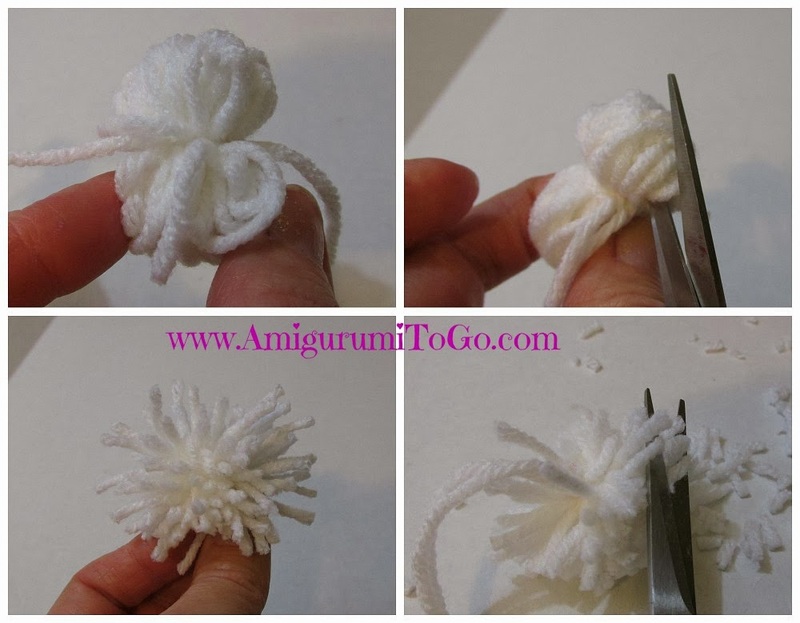 Using a 12 inch length of yarn, tie off middle, knot and pull tight, leave the yarn tails long and use them to sew the pom pom to the hat. 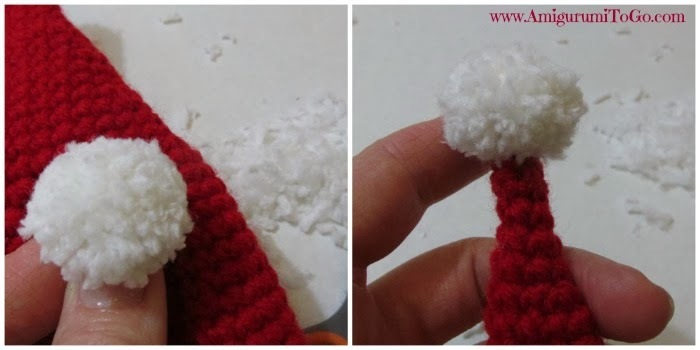 Cut all the loops then give the pom pom a yarny hair cut all over and cut fairly short. See this video if you need more help making a pom pom. I gave a pattern for a scarf in the mouse pattern but thought I'd offer this one as well, it's not as wide as the other one and is made of 2 rows only. And now you're done. I hope you enjoyed the patterns! Post pictures on my facebook page Amigurumi Freely. Or post them on instagram with the hashtag Sharon_Ojala. Oh yea! The mouse hat. So cute. Thanks for sharing your talents with us. Much appreciated. Me again finally, I see good and faithful Sharon continues to Give. Thank you so very much, my husband was sick when I started with you about two yrs ago, he went to be with Jesus so got my yarn out again. Out of nowhere ppl been wanting to buy, well always starts with adorable monkey, but now I have orders for other animals for Christmas gifts. Lord is going to keep me busy so won't have to dwell in mosning. This has made a joyful Christmas Sharon so want to thank you again. This is such wonderful therapy plus can help pay for new hearing aid I need. May your holidays be will all things wonderful. Hope the children have a grand one also. Ohhhh one gal wants the Christmas friendly critters... did do parten for the sleds?? So glad will make these for first time. You are a Blessing!! I'm so very sorry for your loss. Such a difficult thing to go through. I can't tell you how happy I am to hear that crochet is like therapy for you. I am the same, feel the same as you. As long as I can craft, build or crochet I can find peace and comfort even through the sad times. To be creative, use the mind and keep the hands busy is the best therapy. I'm thrilled to hear of your sales! That's is so awesome that your creations will help pay for the hearing aid. Yes, I did do the pattern for the sleds. I updated this pattern page so if you scroll up, under the first photo in my description, I added the link to all the patterns available in this set. The set is called "Winter Friends". I wish you all the best and many Blessings to you during the upcoming holiday season and beyond!